I spent about an hour yesterday at The City Auditorium attending an antique fair. It really put me in the mood for Christmas. It was also nice to see some new-to-me vintage Christmas decorations! 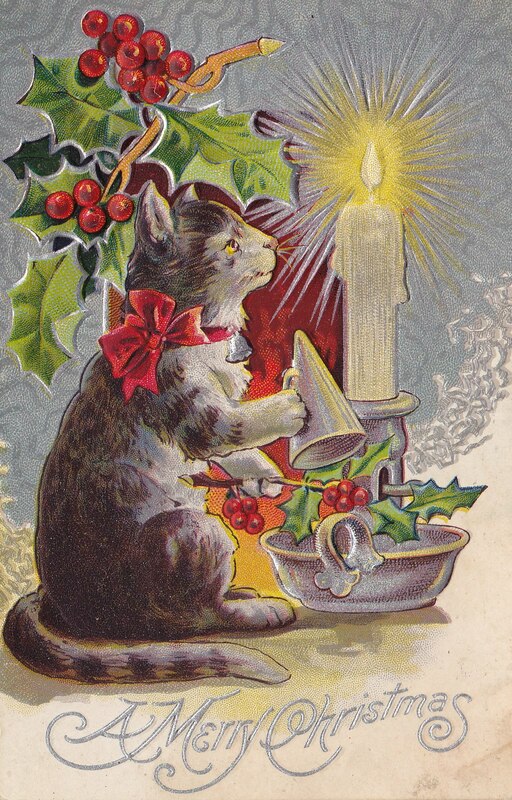 There were displays of putz houses, vintage Shiny Brite ornaments displayed on metal Christmas trees, festive holiday elves and these cute Christmas cat postcards. 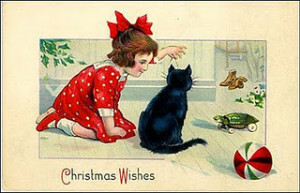 What is your favorite childhood Christmas memory? Do the Christmases of your childhood affect how you celebrate the holidays today? This entry was posted in Author Quotes, Christmas, Vintage Postcards by Writing Nag. Bookmark the permalink. This is very nice. My human has too much clutter around here, so I posted the eBay link to my fan page. Maybe one (or more) of my followers there will want to bid. Postcard is now sold, I removed the link. You're selling your postcards!?! I have mixed emotions – part of me wants to buy some. The other part thinks I already have enough! Will be putting up my Putz today, had trouble finding “Buffalo Snow ” mat. 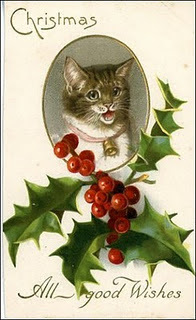 Must check my antique card collection for “Cat” related.